This has been the busiest. Month. Ever. We spent August gearing up for the wedding of the century (it did not disappoint–holy WOW, Kitty and Jim!) and have barely had time enough to breathe, let alone cook things we aren’t sure we’ll like. During the wedding prep (it was a masquerade ball, so we didn’t want to stick out for the wrong reasons), Jason went to Montreal for his all-staff retreat, then my brother came to visit. We then went to Denver where Jas met all my various and sundry friends, and I then immediately headed to Chicago for my work retreat, and finally Jas just got back from New York. xD Still, we’re back at it until the next travel bug bites us! THIS IS SO GOOD! Spicy and filling and protein packed! Deliciously spicy, satisfying, and filling chickpea dish. I’m actually not missing chicken (to which my beau is allergic, as he has recently discovered) much today! ½ tsp. red pepper flakes (or more if you like a lot of heat!) We used a tablespoon. Will probably use two next time. To make quinoa, rinse and soak for about 10 minutes in warm water. Bring 2 cups of beef broth (we used two cups of water and two bouillon cubes) to a boil in a small saucepan, drain quinoa and add to boiling broth. Add 1/3rd to half the can of juice from tomatoes. Cover and reduce heat to a simmer, cooking for about 15 to 20 minutes. Turn off heat and allow quinoa to sit for 5 minutes, then fluff with a fork; set aside. In a large skillet over medium-high heat, drizzle olive oil and sauté onion and garlic and jalapeños until fragrant, about 3 minutes. Add the chickpeas, tomatoes and the rest of the ingredients (minus the cilantro), stirring to combine. Towards the end, add the cilantro. 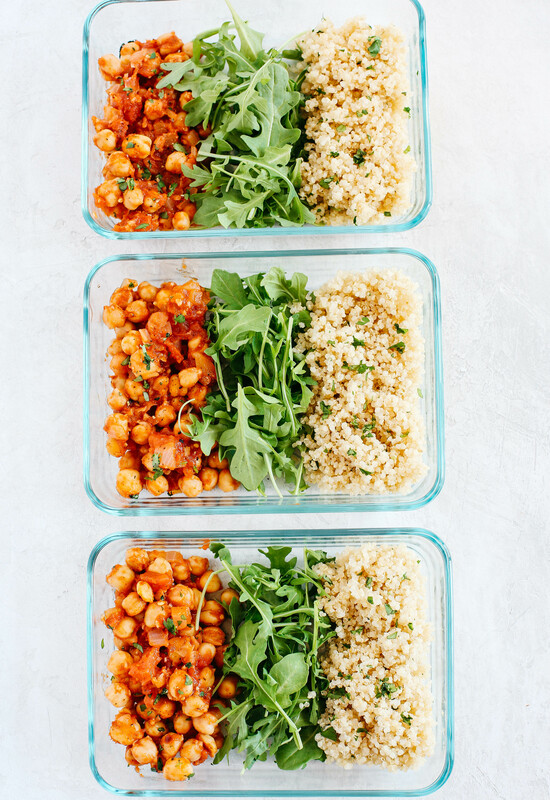 To assemble the bowls, lay down a bed of greens, place ½ cup quinoa in each bowl and top with a heaping ½ cup of the chickpea mixture. Recipe adapted from EatYourselfSkinny.com. If you want a less spicy or all-vegetarian option, use their recipe instead of our modified one! IT IS SO GOOD!